I’ve always been known for being a massive reader – my mum used to say that I’d look at the paper when I was 1 as if I was reading it, and taught myself to read when I was 3. I currently have two large bookshelves groaning under the weight of my book collection. In my office, I have shelves full of business related books and downstairs is my fictional book collection (oh, and there’s a small stack in the kitchen of cookbooks of course). I got an iPad back in September, and have enjoyed reading books on it, but I still love reading my “physical” books. However this week, two different things appeared which made me think about books. The boyfriend bought himself a Kindle (which should hopefully stop him buying so many heavy books at the airport!) and a hardback book that we have both been wanting to read.Ã‚Â The book, GCHQ, is about the history of the Governments communications agency, going back to the origins in 1919 and the work done in the Second World War at Bletchly Park. 3) There are some things that I don’t quite get, so have to look them up, which usually ends up to a Wikipedia spiral and I emerge, an hour later, reading about something so far from the original subject. Two of these problems are solved by using my iPad. It’s a little awkward, but I can carry it with one hand, and by highlighting a word, I can look it up in the dictionary. Easy!Ã‚Â I’ve not had much of a chance to use the Kindle, and have only looked at the dictionary so far. It looks like it would be quite good to read on this, because of the small size (it’s smaller than the iPad) but it doesn’t have a back lit screen, so the iPad would win out over this again. I would have bought this book in iBooks, but for two reasons. 1) In the e-book (at least in the sample of this book I downloaded), there were no images. That probably doesn’t seem like such a problem, but at the start of the book, there are two maps, one of the UK and one of the world, with numbered points to show where certain places are. In iBooks, this is just a list of places. This post has sort of gone into a bit of a ramble about all my thoughts on eBooks. Let me try and close this properly. Ebook readers are great, and there is sure to be something that matches your needs and budget. I have spindly weak arms, and get annoyed carrying books. 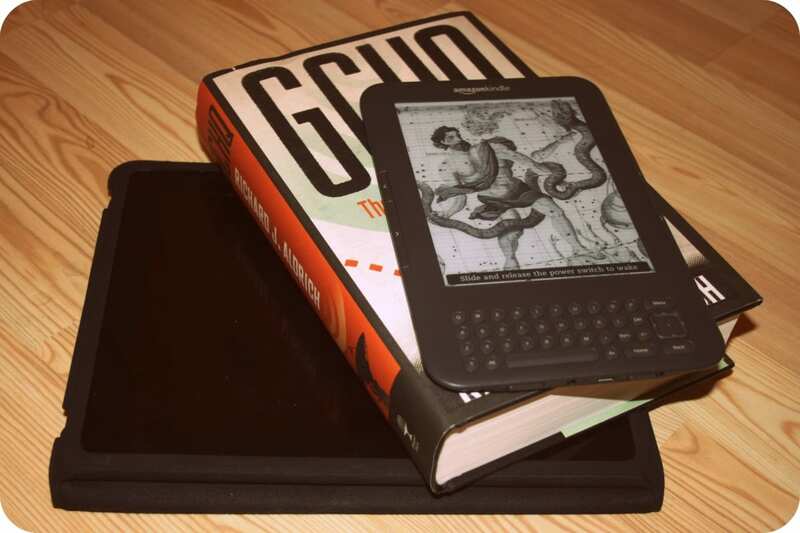 What do you prefer – physical or technology-based books? If you have an ebook reader, do you find you read certain types of books on those more than others? * I know that some people might dislike the whole book selling at low low prices at the supermarkets, but how different is it to buying from Amazon? I always would have said that ‘real’ books win for me… but then my mother had a Kindle for Christmas, and I was completely converted. I bought one for myself last week and I don’t think I’ve put it down since it arrived; I love the fact I can see a book on Amazon, think “that looks good” and have it in my hands a second later. I thought I’d miss the act of turning a page, but I really don’t. It’s quite satisfying clicking that button, actually. And not having a backlight means nothing to me; my case has a little light on it, and real books don’t have backlights either! I’m also totally converted to the Kindle, although I miss browsing in physical bookstores – one day I’d love to see a pricing structure where you can buy both the physical and electronic versions of books at a reasonable price. An OFT enquiry into ebook pricing launched the other day – they agree that it’s simply too high given the lack of overheads etc. so hopefully they’ll start getting cheaper soon. Real books win for me, but the kindle is appealing for lightness and smallness. I’m reading quite a large book at the moment, and it’s jsut too heavy for my handbag. Okay, I have to defend the pricing. e-books have all the same overheads as printed ones except the printing and warehousing, which are only the last steps in a minimum of a year’s work at the publisher, not to mention the months or years that the author put in. When you add to that your completely correct comment about VAT applying to e-books but not printed ones, there is really no reason for them to be cheaper at all. And yet they usually are, if only by a pound or so. If supermarkets start selling e-books from their websites, I bet the crazy deals will start applying to them as well. Oh, and also I haven’t yet played with the Kindle much but it does seem nice to read, convenient to carry around and the screen is amazing. I hate reading backlit stuff, it hurts my eyes. I’m trying to persuade Tim to buy some e-books we both want to read so I can try it out properly! i really liked this post. it’s quite similar to the blog v magazine debate. i really hope there is a place for both! The Kindle (and all other e-readers) are only really good for reading fiction books. As you have found, some non-fiction books aren’t displayed correctly on an e-reader. I too have so many books taking over, and have considered an e-reader, purely for the fact that it’s easy to carry around in my handbag, would save so much space, holds so many books and would be a blessing to take on holiday/travelling. However, if you do get one, pay a bit more for a Sony one. They are so much better than the Kindle! I used to sell them and at first I always thought the Kindle was better value but the Sony ones use a better format and if you buy a Kindle you will only be able to buy books from Amazon. With a Sony e-reader you can shop around a bit more on different websites (but not Amazon!) and get better deals. Unless you shop a lot at Amazon then the Kindle is good. The Sony one is my personal preference though, and if I do decide to get one it will be one of those. I still haven’t quite made my mind up either yet! It may sound stupid but I love the covers of ‘real’ books too much! I got a Kindle for my birthday in December and I really don’t think I’ll buy a ‘real’ book again. I *love* books (and my reading history is much like yours – I was a bookworm at 3!) but they’re so inconvenient compared to the Kindle. I have hundreds on mine at the moment and I’m slowly working my way through them. There are offers to be found – in Dec Kindle did a ’12 Days of Kindle’ promo where a range of great books could be downloaded for free. And all the classics are free – Austen, Orwell, Shakespeare, etc. I also find books are cheaper on the Kindle, even when you factor in the supermarket deals. I haven’t paid more than Ã‚Â£3.50 for any books I’ve downloaded, including new releases and best sellers. I love the aesthetic of a real book – I have shelves and shelves of my favourites around the house, and I’ll always keep them and display them. But I’ll definitely stick to e-books for reading from now on.